Establish your business’s vision, mission, and values to tell the world about your business accomplishes. Even if you have your business’s vision, mission, and values in mind, you need to commit those factors to writing to reflect the essence of your company. Your vision statement: Defines your long-term aspirations. It explains why you’re doing what you’re doing and the ultimate good you want to achieve through your success. Think of your vision as the picture of where you ultimately want your work to lead you. This figure shows a worksheet that can get you started. Your mission statement: Defines the purpose of your company and the effect you intend to have on the world around you. It states what you do for others and the approach you follow in order to achieve the aspirations you’ve set. Think of your mission as the route you’ll follow to achieve your vision. 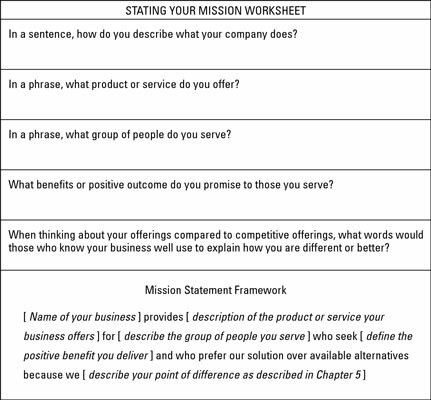 You can use this figure’s worksheet to get your mission statement focused. Your business promise: Summarizes the positive difference you deliver to all who deal with your organization. Internally, your business promise guides the development of all elements of your brand. Externally, your business promise is sometimes translated into and presented as a motto or tagline.